After a two-week summer cold, I’ve been having trouble getting back up to my old productive ways. I’ve been toying around with getting all Lifehackery and resurrecting one of the motivational schemes I’ve dabbled in. Here’s the details of something I used to do. In a nutshell, Points! is a system for paying myself for necessary but uncompensated labor. It’s a basic gamification scheme; necessarily basic because I’m not very game-wired. The template is the sort of arcade/Boy Scouts: accumulate points and cash them in at the trading post system that got us so many plastic army men with parachutes and whittling knives with the Boy Scouts emblem on the handle. Points are assigned to tasks that one wants to complete on a regular basis: workouts, chores, word counts, errands, etc. Points can also be issued by other people for suitably noble gestures like favors, an hour of your time, a home-cooked meal, gifts, art. Limit these to keep others’ appreciation from messing up your system. I keep it to two points per day, issued from outside sources, more if they’re contributing to your points fund. Also: it’s bad form to solicit someone to grant you points. Points are redeemable for various prizes, mostly useless but awesome things. Crossbow, grappling hook, robot arm, Legos, Scotch, projector, comics. You name it. The money for these purchases is already set aside at the outset so their purchase is guilt-free. Start off by determining one action that will be directly convertible to one point. In my case, I made it 33 pushups. From there, you can assign value to other actions based upon their relative difficulty or how little you want to do them. For example, I give myself two points for taking the trash to the curb. 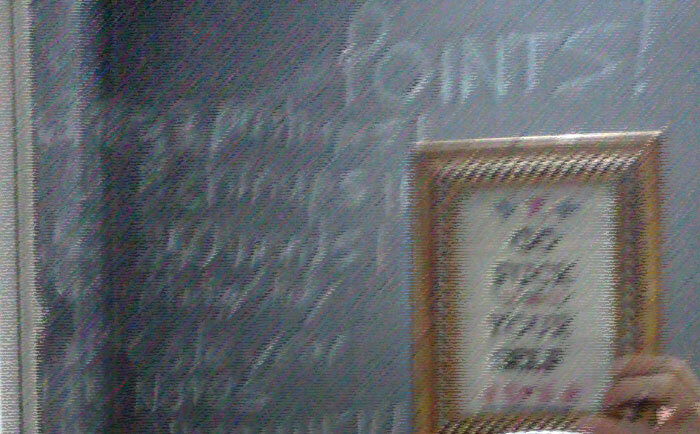 It worked well at the time because my bathroom was painted with chalkboard paint and I could use the walls as my scoreboard/prize catalog. Eventually, the whole thing felt a bit controlling. My enthusiasm for whimsy ebbs and flows with the amount of sunlight I get so it didn’t survive the winter.